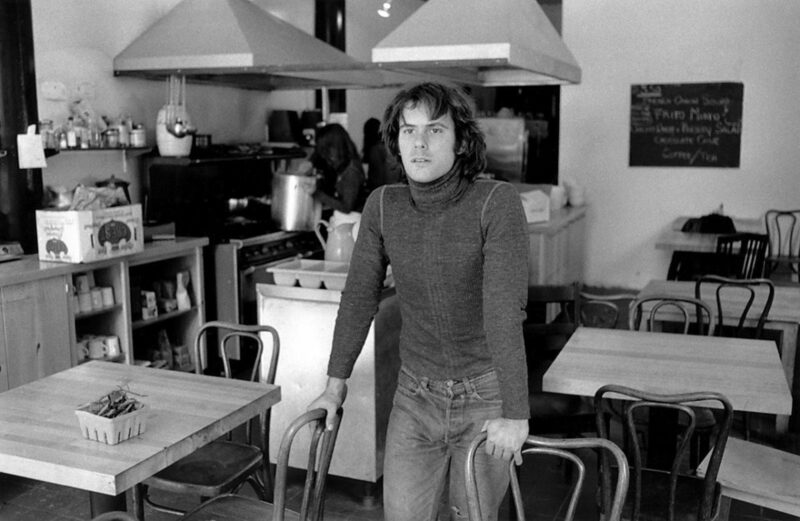 A collaborative project conceived by artists Gordon Matta-Clark, Tina Girouard and Carol Goodden in 1971, during its relatively short lifespan, FOOD established itself as a seminal moment in New York art history. The restaurant-come-relational-artwork occupied the corner of Prince and Wooster Streets, neighbouring 112 Greene Street, the longstanding and instrumental art space. It is perhaps simplest to define FOOD as a restaurant run by artists, yet that definition underestimates the project’s multifarious functions. Operating more like a community centre than a business, the establishment was decidedly sympathetic to the priorities of its employees’ lives and schedules. Before they founded FOOD, Goodden and Matta-Clark were already cooking for artists in New York and had developed somewhat of a reputation for throwing dinner parties for friends, mainly hosted at their loft. In 1971, they roasted an entire pig under the Brooklyn Bridge; the communal roast became known as the Brooklyn Bridge Event. The event was accompanied by outdoor sculpture and celebrated the opening of the Alternative Gallery Space on Greene Street. The sculptures at the pig roast had been curated by Alanna Heiss of the Museum of Modern Art, with music by Dickie Landry and the Phillip Glass Ensemble. Following their ventures into hosting, the pair found the idea of creating a restaurant that served fresh food in a communal setting appealed to them. At FOOD, the dishes were as much an artistic medium as a form of nutrition. Typical of FOOD’s approach was Matta-Clark’s “bone” dinner: marrow and oxtail soup, the remains cleaned at the meal’s end and strung as jewellery for the diners, which mostly comprised fellow artists, musicians, and dancers from the Downtown scene. The project lasted three years, until Goodden nearly spent her entire family inheritance investing in it. 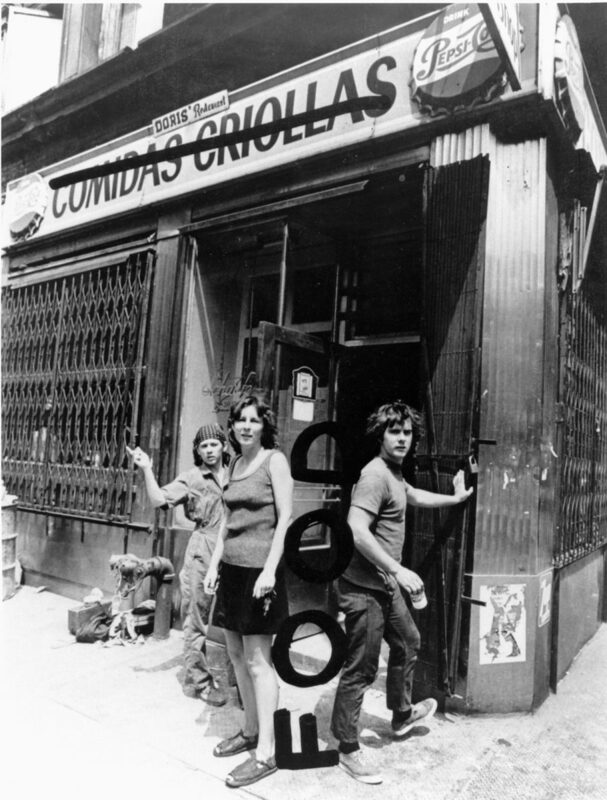 The above photograph shows Matta-Clark, Goodden and Girouard standing in front of Comidas Criollas, the old bodega they renovated to house FOOD. The collaborators were engaged not only with the infrastructure of the neighbourhood but with its social configuration as well. FOOD was a much-needed convening point for an area that was undergoing significant social change. Due to the fact that Soho was not yet considered a residential neighbourhood, it had little to offer in the way of eating establishments, especially after business hours. While FOOD filled a useful void, providing much-needed sustenance, it also became, as art historian Nicole Woods puts it, “A serviceable, social-able artwork,” as artistic labour became part of a transactional performance. 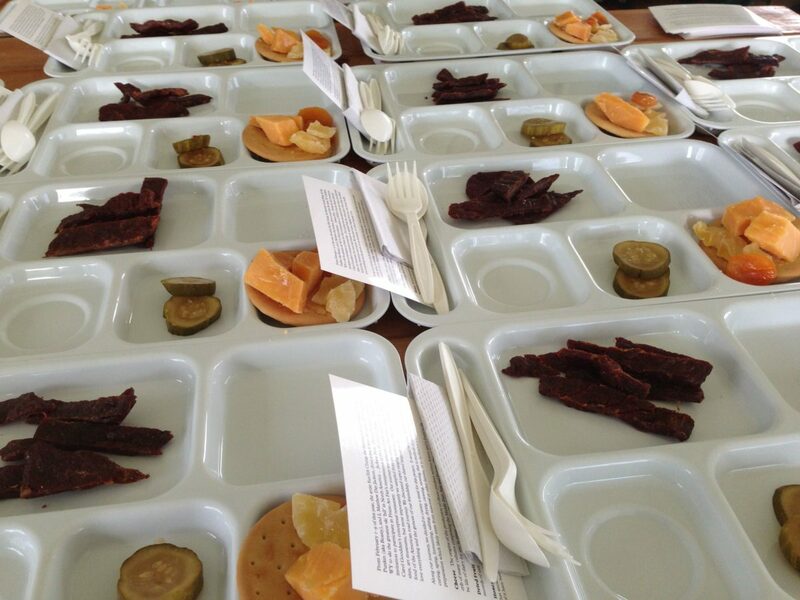 At Frieze New York 2013, Frieze Projects organised a special homage to FOOD. This tribute took the form of a temporary restaurant where the history and legacy of the project was celebrated. A meeting space, a restaurant and a total work of art, the original FOOD project was driven by the energy of the people that ran it and those who gathered there. In the same spirit, FOOD 1971/2013 was a dynamic platform where each day a different artist was invited to cook in a convivial environment. Both a restaurant and performance stage of FOOD 1971/2013 were spaces where cooking and art were discussed, inspired and produced. Reflecting on Matta-Clark and Goodden’s original endeavour, FOOD was remarkably prescient in many aspects. As writer Matthew Shen Goodman points out: “It oversaw the communal meal as art before Rirkrit Tiravanija’s curries, and served tasting menus and locally sourced ingredients before bone marrow was considered a delectable. It also fomented a certain artistic spirit and image that was arguably a harbinger of the “creative class”-driven economy that has now saturated New York, even though it’s doubtful that the founders intended FOOD as a prototype of the artist-as-forerunner model of gentrification.” Within the context of the art world, and beyond, FOOD continues to be a pertinent point of reference, as a growing movement among contemporary artists sees ever more forays into food and dining as a democratising form of creative practice.